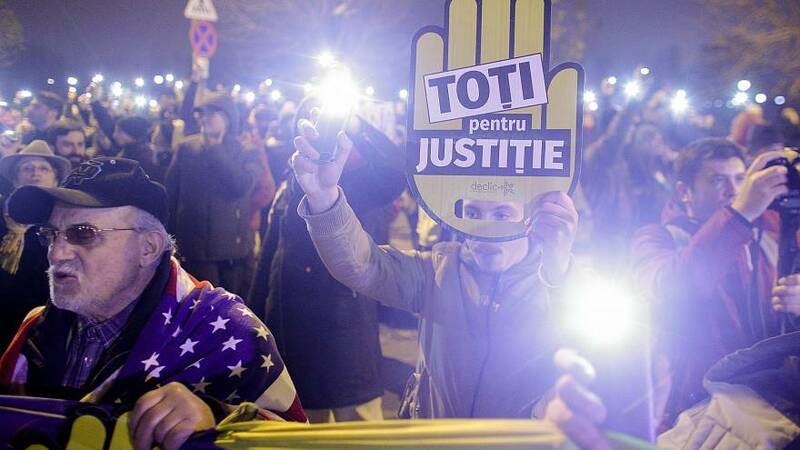 Tens of thousands of people took to the streets across Romania to protest a plan to overhaul the justice system. Demonstrators say the changes, which were introduced by the ruling Social Democrats, would place the system under political control and undermine anti-corruption efforts. Former prime minister Dacian Ciolos was among those protesting in Bucharest. “For Romania, it’s essential that justice is allowed to do its job and that no one uses political power in parliament or in government to undermine the system simply to serve the interests of certain political leaders who have judicial problems,” he said. Sunday’s demonstration was the biggest since mass ive anti-corruption protests at the beginning of the year. “We are here to fight for our justice to fight for our laws and for our dignity and our freedom,” said one woman at the protest in Bucharest. She said she had come to some 10 to 20 protests in the square in the last 10 months. Demonstrations erupted earlier this year after the government moved to decriminalise official misconduct. The plan was eventually scrapped after more than two weeks of daily demonstrations. “I think it is a very classical example of conflict between very conservative elite that tries to preserve its access to resources without being sanctioned and one progressive part of the society,” said journalist and blogger Vlad Petreanu. Romanian prosecutors have investigated hundreds of public officials in an anti-corruption push over the past decade.